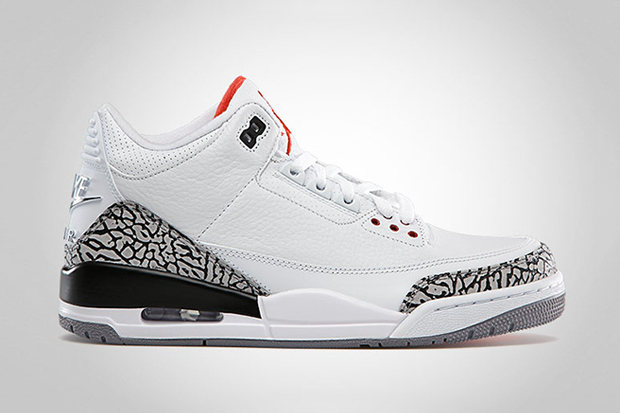 The classic White Cement color way of the Air Jordan 3 has been issued a re retro many times including a very recent drop in 2011. For 2013, it was released yet again albeit in an '88 moniker, sporting the familiar White tumbled leather upper. The elephant print overlays on the toe and heel as well as the Fire red accents on the tongue, liner, and lace holes are still the same. However, the Jumpman on the heel was replaced for a traditional Nike Air logo complete with the swoosh to resemble the original.